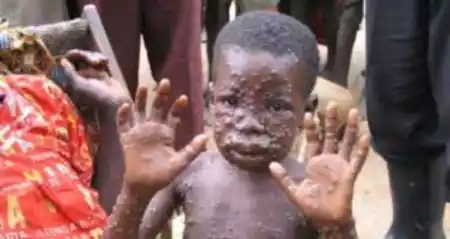 September of a case of suspected Monkey pox in an 11 year old boy in Bayelsa State and 11 other cases which are currently receiving medical treatment Further the NCDC said that another 32 dose contacts of the cases have been identified, advised and closely monitored. public health response to the outbreak. chicken pox and small pox. had the Central African and the West African types -”the West African type is milder and has no records of mortality”, he said. monkeypox are severe headache, fever, back pains amongst other symptoms, adding that most worrisome of all the signs were rashes bigger than those caused by chicken pox. “We have seen cases from as far as Biseni. illness. As a state we are taking care of all the expenses of all the isolated cases. it is also self-limiting in the sense that within two to four weeks, you get healed and it confers you with immunity for life. on top of the situation. “People should wash their hands whenever they go in or come out of their houses. If they touch with animals, they should ensure that they wash their hands. and to report any similar cases to the relevant authorities.